Tessa is a good girl with a sweet, reliable boyfriend back home. She's got direction, ambition, and a mother who's intent on keeping her that way. But she’s barely moved into her freshman dorm when she runs into Hardin. With his tousled brown hair, cocky British accent, tattoos, and lip ring, Hardin is cute and different from what she’s used to. But he's also rude - to the point of cruelty, even. For all his attitude, Tessa should hate Hardin and she does — until she finds herself alone with him in his room. Something about his dark mood grabs her, and when they kiss it ignites within her a passion she’s never known before. He’ll call her beautiful, then insist he isn’t the one for her and disappear again and again. Despite the reckless way he treats her, Tessa is compelled to dig deeper and find the real Hardin beneath all his lies. He pushes her away again and again, yet every time she pushes back, he only pulls her in deeper. Book Two of the After series&#8212;­now newly revised and expanded, Anna Todd&#8217;­s After fanfiction racked up 1 billion reads online and captivated readers across the globe. Experience the Internet&#8217;­s most talked-­about book for yourself! After a tumultuous beginning to their relationship, Tessa and Hardin were on the path to making things work. Tessa knew Hardin could be cruel, but when a bombshell revelation is dropped about the origins of their relationship&#8212;­and Hardin&#8217;­s mysterious past&#8212;­Tessa is beside herself. Book Three of the After series&#8212;­now newly revised and expanded, Anna Todd&#8217;­s After fanfiction racked up 1 billion reads online and captivated readers across the globe. Experience the Internet&#8217;­s most talked-­about book for yourself! Just as Tessa makes the biggest decision of her life, everything changes. Revelations about first her family, and then Hardin&#8217;­s, throw everything they knew before in doubt and makes their hard-­won future together more difficult to claim. Tessa&#8217;­s life begins to come unglued. Nothing is what she thought it was. Not her friends. Not her family. The one person she should be able to rely on, Hardin, is furious when he discovers the massive secret she&#8217;­s been keeping. And rather than being understanding, he turns to sabotage. Book One of the After series—the Internet sensation with millions of readers. 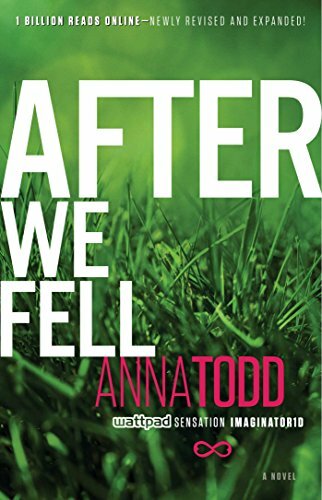 Book Three of the After series—now newly revised and expanded, Anna Todd’s After fanfiction racked up 1 billion reads online and captivated readers across the globe. Experience the Internet’s most talked-­about book for yourself! Tessa and Hardin’s love was complicated before. Now it’s more confusing than ever. AFTER WE FELL...­Life will never be the same. #HESSA Just as Tessa makes the biggest decision of her life, everything changes. Revelations about first her family, and then Hardin’s, throw everything they knew before in doubt and makes their hard-­won future together more difficult to claim. Tessa’s life begins to come unglued. Nothing is what she thought it was. Not her friends. Not her family. The one person she should be able to rely on, Hardin, is furious when he discovers the massive secret she’s been keeping. And rather than being understanding, he turns to sabotage. Tessa knows Hardin loves her and will do anything to protect her, but there’s a difference between loving . . .
It’s never been all rainbows and sunshine for Tessa and Hardin, but each new challenge they’ve faced has only made their passionate bond stronger and stronger. But when a revelation about the past shakes Hardin’s inpenetrable façade to the core—and then Tessa suffers a tragedy—will they stick together again, or be torn apart? As the shocking truth about each of their families emerges, it’s clear the two lovers are not so different from each other. Tessa is no longer the sweet, simple, good girl she was when she met Hardin—any more than he is the cruel, moody boy she fell so hard for. Tessa understands all the troubling emotions brewing beneath Hardin’s exterior, and she knows she’s the only one who can calm him when he erupts. He needs her. But the more layers of his past come to light, the darker he grows, and the harder he pushes Tessa—and everyone else in his life—away. Tessa’s not sure if she really can save him—not without sacrificing herself. She refuses to go down . 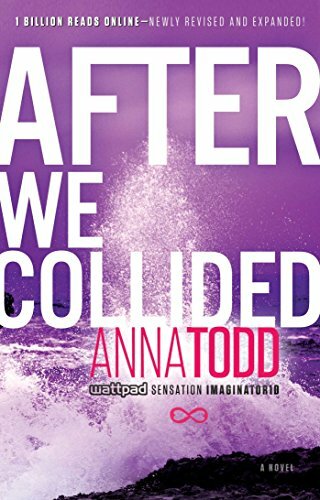 . .
Anna Todd - After We Collided (After #2) *New Adult* RD: Nov 25, 2014 Tessa has everything to lose. Hardin has nothing to lose…except her. AFTER WE COLLIDED…Life will never be the same. #HESSA After a tumultuous beginning to their relationship, Tessa and Hardin were on the path to making things work. Tessa knew Hardin could be cruel, but when a bombshell revelation is dropped about the origins of their relationship—and Hardin’s mysterious past—Tessa is beside herself. Hardin will always be…Hardin. But is he really the deep, thoughtful guy Tessa fell madly in love with despite his angry exterior—or has he been a stranger all along? She wishes she could walk away. It’s just not that easy. Not with the memory of passionate nights spent in his arms. His electric touch. His hungry kisses. Still, Tessa’s not sure she can endure one more broken promise. She put so much on hold for Hardin—school, friends, her mom, a relationship with a guy who really loved her, and now possibly even a . . .